A year and a half after the Second Lebanon War and nine months after the publication of the interim report, the Winograd Commission presented its complete report into the failures of the 2006 war to Prime Minister Ehud Olmert and Defense Minister Ehud Barak. The committee chairman, retired Justice Eliyahu Winograd, arrived at the Prime Minister's Office in Jerusalem just before 5 pm Wednesday to deliver the 500-page report to the prime minister and defense minister. Defense officials said the final report concluded Olmert did not fail in his handling of a key battle and that his decisions were "reasonable." More than 30 Israeli soldiers were killed in a last-minute offensive launched shortly before a UN-brokered truce went into effect. Olmert had come under severe criticism for ordering the battle, despite his contention that the offensive improved Israel's position before the cease-fire. The officials said the report acknowledged the operation failed to achieve its goals. .
At 6 pm, the committee will hold a press conference at International Convention Center (ICC) in the capital, and Justice Winograd will read out the main parts of the report. 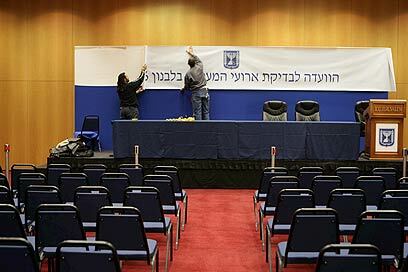 Hundreds of reporters from Israel and the world will be present at the press conference. The Jerusalem Municipality tasked a number of snowplows and salt-distributing machines with clearing the main avenues of traffic in the capital in order to ensure the arrival of the committee members to the Prime Minister's Office and the ICC. The judge and the other four members of the governmental commission of inquiry - Law Professor Ruth Gavison, Political Science Professor Yehezkel Dror, Major-General (res.) Menachem Einan and Major-General (res.) Chaim Nadel – have listened to 75 witnesses and reviewed tens of thousands of documents since their appointment in September 2005. The witnesses included decision makers, politicians, officer, government workers and public figures. The committee was authorized to investigate the Second Lebanon War and the preparations for the war, including the conduct of previous governments and their handling of the Hizbullah organization since the IDF's withdrawal from Lebanon in 2000. The committee was instructed to probe the political and security echelon, the management of the war over 33 days of fighting, and the handling of the home front. See all talkbacks "Winograd report submitted to Olmert, Barak "